During every play, senior infielder Taylor Bradley is one of the first Panthers to support her teammates. Taking on important responsibilities is what she has always done—and now it’s her only option. Bradley’s been sidelined for over six weeks after having surgery on her right wrist. Her injury keeps her off the field, but she remains a great teammate. “If you are injured or you happen to be injured ever, [the main thing] is keeping that positive attitude and really working on your mentality through that because it is as much mental as it is physical,” Bradley said. Bradley’s team-first approach makes her more valuable to the Panthers because she can contribute in many areas. Whether she’s available to play or not, her teammates view her as a leader, motivator and positive force. “I think a huge part of it is just being there for my teammates, being positive, bringing my positive energy because I know that it’s contagious and it spreads. So that’s my role right now, since I am injured,” Bradley said. She and volunteer assistant coach Daniel Stockdale have tried to call the opposing pitchers’ ball. Bradley does this to mentally stay in game as much as possible. Her mindset stems from seeing a parallel outside of sports; roadblocks don’t stop the trip that has to made. “I haven’t been a consistent starter all four years here, so my energy hasn’t changed. Being a good teammate will carry into other aspects of life. So, I know that if I’m doing this here behind the scenes, then it’ll carry when I work, into my career later in life [and] into all aspects,” Bradley said. 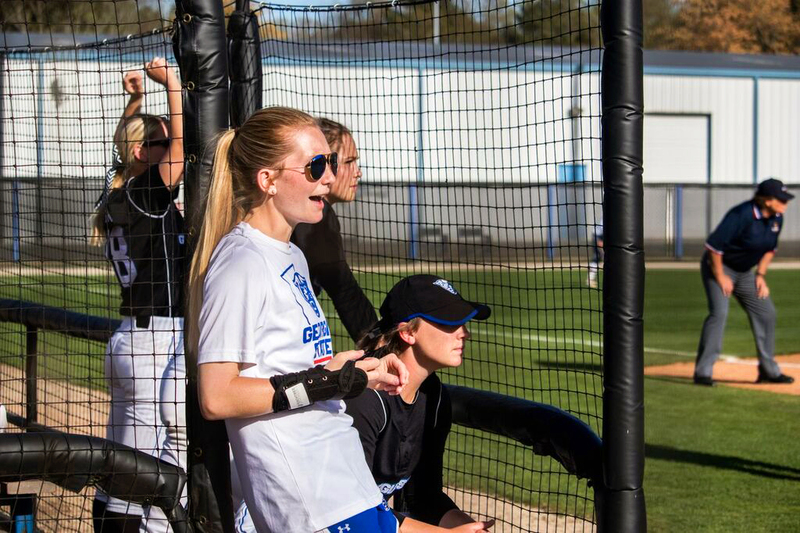 During Georgia State’s March 28 game against Georgia Tech, Bradley spoke with pitcher Mandy Chance several times after she gave up two runs in the first. Chance didn’t allow another run, and Georgia State rallied to win 3-2. “If anyone’s ever struggling [or] having a bad day, I try to talk to them and make sure that they kind of change their mindset and realize that they really are in a lucky spot to be here on this team right now. It’s an honor to be a part of Georgia State softball,” Bradley said. Bradley takes the same approach in practice settings. Fellow senior and roommate Ivie Drake appreciates her selflessness, specifically the willingness to be the 10th man on the field. “She’s been nothing but the biggest cheerleader in the dugout,” Drake said. “She picks everybody up, she always makes them laugh, she’s always right in front of the dugout cheering. There’s not one time where she’s not cheering. Bradley’s chance to wear the Georgia State uniform again gets smaller each week. In hope of getting back on the field one last time, she’s been pushing her body and getting stronger in the gym. But, pushing her teammates always sits at the top of her list of priorities. “That’s my role on this team; to be a leader, make sure that the girls are playing for the seniors. This is your last shot to do this,” Bradley said.